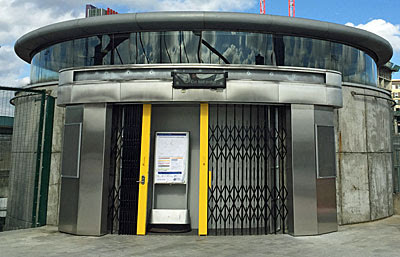 Here's a tube station entrance built in 1999, but which only opened to the public this month. They plan ahead on the Underground. This is the Rotunda Building at Canning Town station, originally part of the enlargement works for the Jubilee line extension. If you come down from the trains into the ticket hall and prepare to turn right towards the bus station, the base of the Rotunda Building is on your left. You won't see it, you'll only see a door. It's a posh door too, with a lattice design overlaid on the glass, and the name of a housing development alongside. Push the door open, assuming it's not locked, and you'll see a lift (and a 70-step staircase curling round it) leading up to a silvery concrete rotunda at ground level. This exit leads out to Bow Creek, and a riverside promenade with lamps and benches that's been sealed off for well over a decade. Hurrah, a secret section of the lower River Lea has finally been reopened to the public! Except there are issues. 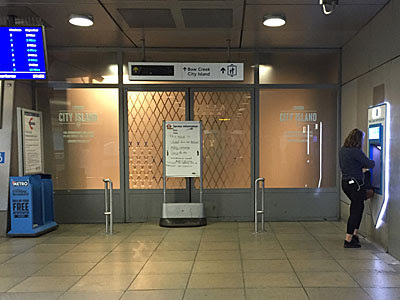 A whiteboard has been shoved in front of the glass door in the ticket hall, with a message that reads "This exit is closed due to technical safety concerns". It's not entirely clear what these concerns are. If there was a problem with the lift, presumably the stairs would still be OK, and if there was a problem with the stairwell, vice versa. Perhaps we're not allowed one without the other, or maybe there's a more global issue affecting the internal environment or egress. A sign I spotted elsewhere says there's a "station compliance issue", which might just mean a bit of misplaced paperwork, or could be quite serious. Whatever, the Bow Creek exit is currently sealed off "for the foreseeable future", I think less than a fortnight after it officially opened. The catalyst for opening up this entrance is the City Island development, a cluster of apartment blocks erected along the Leamouth Peninsula with foreign investors in mind. Ten years ago their luxury enclave was a hydrogenated fat refinery, but times change, and this thin tongue of land is being reborn as a mixed-use development instead. Bow Creek meanders in two wild contortions as it approaches its mouth, making this a particularly inaccessible location, indeed the most isolated spot in the whole of Tower Hamlets. 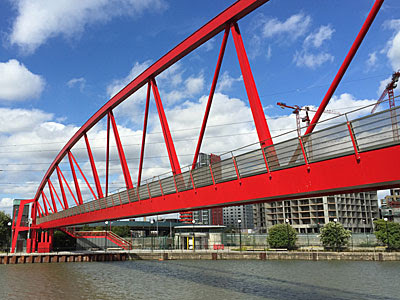 But new housing demands good transport links, so two years ago a footbridge was installed to link the tip of the development to Canning Town, specifically to the new station entrance. And only recently have the first residents moved in, so only recently has the footbridge opened to the public, providing a direct link to trains and buses. Or rather that was the plan. 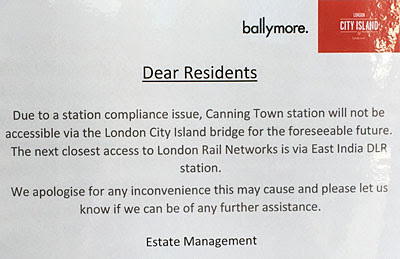 "Sorry for the inconvenience caused" is the apology proffered on the whiteboard at Canning Town. But it is a considerable inconvenience, a bleak fifteen minute walk along the dual carriageway, down the long meander and up the Leamouth dead end, rather than a quick dash over the footbridge. It makes a complete mockery of the marketing blurb in the City Island brochure, which claims Canary Wharf is four minutes away, and Queen Elizabeth Olympic Park six - indeed it currently takes longer to walk to the nearest station that it does to travel onward to the City. But that's what happens when you buy an apartment off-plan based on over-exuberant promises, as the earliest residents of this "island neighbourhood" are now finding to their cost. On the bright side, for the rest of us, the brief time the new station entrance was open inspired the Bow Creek Ecology Park to unlock a gate. I've been coming here for years, enjoying the pools and greenery and nesting grounds of this riverside nature reserve, but up until now it's always been a dead end. You could walk down the peninsula, duck beneath the DLR viaduct and head back up the other side, but there's never been any way out at the far end. And now there is. 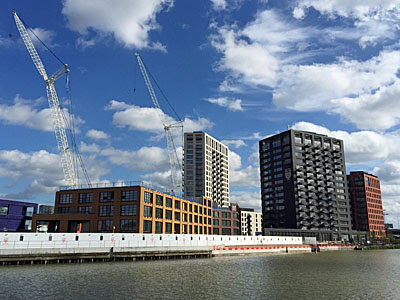 The connecting path to Canning Town station is now open, in daylight hours at least, allowing passage to a section of riverbank that's been sealed off for years. There ought to be a more direct link across the DLR, but the gate in the middle of that particular ramped footbridge remains inexplicably locked, denying City Island residents another form of alternative access to the real world. "Yay, finally" I thought, as I rounded the ecology park and finally reached that creekside promenade. The lamps and benches suggest this area has always been intended as a 'destination', but building works and/or funding and/or security permanently sealed it off. The promenade curves on for a while too, past passengers waiting on the adjacent DLR platforms and downstream to the edge of a Crossrail construction site. Workers there had previously been the only people allowed to use the special station entrance, but now I too could stand in front of the rotunda and admire, if not enter. What most amused me was how there was no sign announcing this isolated entrance was closed, just a board showing all the planned line closures for the week ending 21st August, because some jobsworth rule decrees this must appear. And the footbridge, the footbridge was open too! I'd entered a competition to name it back in 2003, and now finally I was standing on it (admittedly a different, rather cheaper design). The red ironwork is supposed to resemble a cat's cradle, and I believe there's machinery to raise the whole thing if anything tall ever sails down the Lea. This being the 21st century there are lifts for step-free access at each end, plus there's bench seating along one side, which is a nice low-key touch. How nice to get a completely different perspective on the river, and to be able to cross to a post-industrial peninsula that's been out of bounds for decades. City Island's Marketing Suite lies on the opposite side, at the tip of the peninsula, while a fenced off waterside path leads around the latest building works to the blocks already completed. Here I stood in the middle of what the brochure laughably describes as "a wooded clearing", but is more a mosaic of pristine lawn and lean-to saplings. Each block is of a different uniform colour, which is City Island's 'thing', and saves it from being yet another example of tedious architectural Biscuitism. At the bottom of the jet black block a concierge sat waiting to be necessary, while the ground floor snooker tables and comfy chairs lay unused, because these are only early days. But the early adopters must feel quite cut off, and will be ruing the closure of the entrance to Canning Town, for however long "for the foreseeable future" turns out to be. 3pm update: A reader writes "It's open today, well at least the staircase is." Further update: The staircase remains open, hurrah. The lift is closed.